I read this question regarding Fireworks layers, where it said that master pages have to be applied underneath other layers. Is this true for InDesign as well? If not, how does one put the Master Page content on top? I was playing out a scenario that another user presented where you'd have one piece of text and different backgrounds. Master pages in Indesign are always seen as on the bottom of the object stack. However, you can use layers in Indesign as well. This somewhat breaks the object stack logic. Layers in Indesign allow you to stack any object, master page or otherwise. 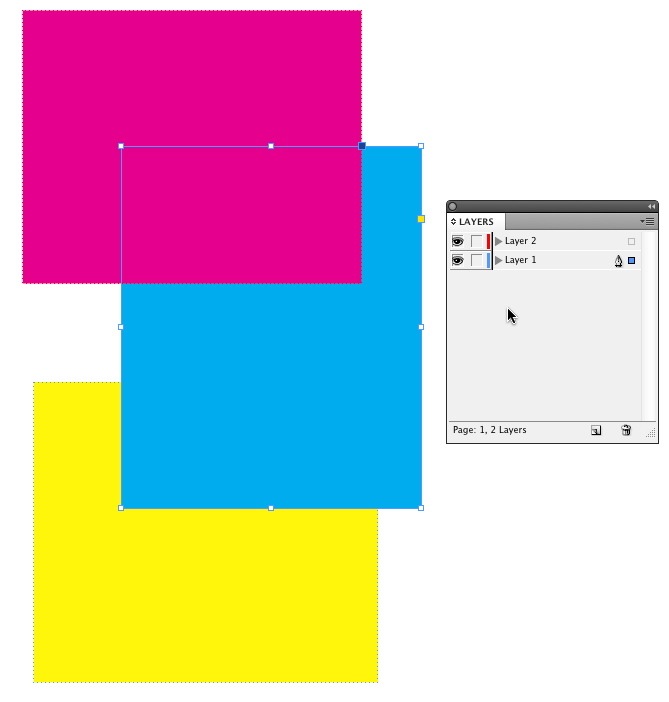 highlight Layer 1 in the Layers panel and draw a filled rectangle. Highlight Layer 2 in the Layers Panel and draw another filled rectangle. The magenta rectangle is on Layer 2 on my Master Page. The yellow rectangle is on layer 1 on the master page. The cyan rectangle is on layer 1 on my document page. So, while master pages are always seen as the bottom of the object stack, layers take precedence and will allow you to stack things above a document page if you place objects on higher layers. In your scenario, you could place the text on the master page on Layer 2, and then place backgrounds on Layer 1 in the document pages. An important note is that you can apply master pages to other master pages. It's possible to have Master Page B which has Master Page A applied to it. This can assist in keeping any design fluent while maintaining common items. Make a new top-most layer (above your current layer). While on top-most layer, navigate to Master-page and add your content. Result will sit above original layer. Not the answer you're looking for? Browse other questions tagged adobe-indesign master-page or ask your own question. Why does my master page move when the page shuffles left/right? What setting allows a master page to be the top level element in Fireworks? How can I add this style to all pages in Indesign? How can you fix a header in InDesign so content scrolls underneath? With InDesign, how can I copy and paste layers to be designated for a specific page?